The experiences of joining and leaving organizations permeate most people’s lives in the 21st century. This book provides a framework for increasing our understanding of those experiences using a mixture of specific examples, scholarly findings, and theoretical concepts and models. Each chapter begins with a realistic scenario that illustrates its concepts and theories. Then the chapters explore the entire socialization process from anticipatory socialization, in which individuals choose occupations and organizations to join, to voluntarily or involuntarily exit from those same organizations. In between, chapters examine the process of entering organizations, learning their culture, developing personal relationships, and experiencing individual transitions, like promotions, and organizational transitions, like mergers and acquisitions, as part of the ongoing socialization process. It expands the study of socialization by considering socialization of organizational volunteers as well as paid employees, and by exploring the ways that work-family issues and new technologies influence the socialization process. Throughout, particular attention is paid to the role and importance of communication in these experiences. The book’s organization allows scholars, students, and organizational participants in every walk of life to increase their understanding of their organizational experiences. It will be particularly useful for those studying organizational communication, business and management. Michael Kramer is professor of communication at the University of Oklahoma. "An intriguing and insightful book that provides deeper insights into complex subjects … An inspiration and must-have book for scholars, students and practitioners in communication, organizational psychology, business and management disciplines." "Kramer's book offers the rare combination of clarity, practical examples, and smooth flow with relevant, current research on organizational socialization. The reader will gain valuable insights into communication influences on individuals' developing vocational interests, adjusting to new organizational environments, and excelling in managerial positions, to name just a few takeaways." 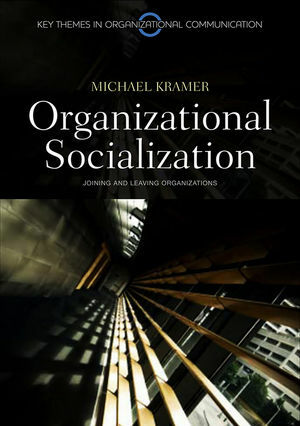 "Kramer's book gives a very thorough summary and review of organizational socialization, explicating the various theories, models, and empirical studies on the subject. The cases threaded throughout each chapter bring the material to life and provide practical understanding of it. Kramer also sheds light on socialization contexts beyond the traditional ‘new hire' situation ... as well as socialization in voluntary organizations. This book not only is useful for students, but is a ‘must have' for organizational scholars in communication, management, and industrial psychology." The first volume in a new series of books from Polity in the sub-discipline of Organizational Communication. Introduces students to the processes of joining, being part of, and leaving organizations, and the importance of communication to all these stages. Chapters examine topics including personal relationships in the workplace, individual transitions, like promotions, and organizational transitions, like mergers and acquisitions. Specifically designed for use on organizational communication courses in communication studies departments, but also highly useful for students of business and management.